On my regular train journeys between Limerick and Dublin, I never cease to be amazed by the sight of Loughmoe Castle, which stands out by the tracks in rich green pastures, between Templemore and Thurles railway stations. 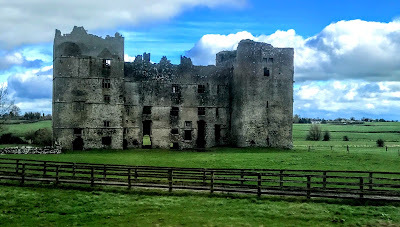 Loughmoe Castle is a 15th century tower house that was extensively added to in the 17th century. The castle was home to the Purcell family, who were given the palatinate title of Baron of Loughmoe by the Butlers, Earls of Ormonde. 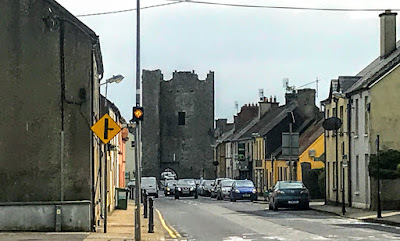 The village near the castle is now known incorrectly as Loughmore, which would mean the ‘Big Lake.’ But the original Irish name is of the area is Luach Mhagh, meaning ‘the field of the reward.’ This name alludes to the legend of how the Purcells first gained possession of this area. 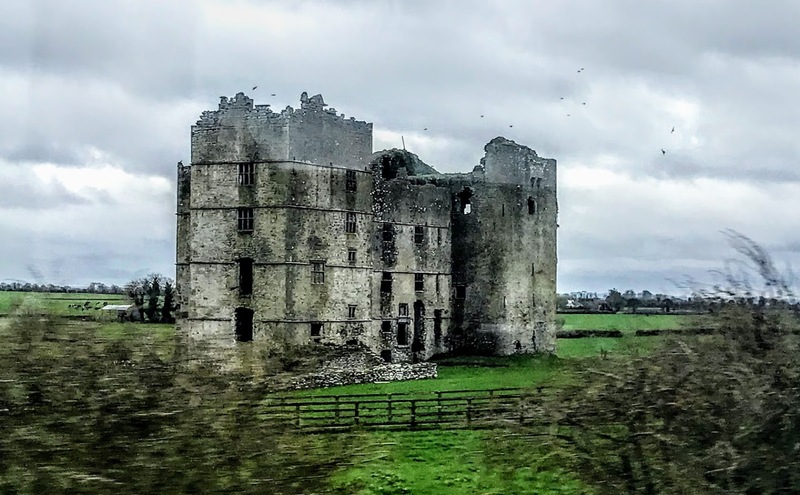 Many years ago, the story says, a king lived in Loughmoe Castle, and the densely wooded land around it was terrorised by a boar and sow of gigantic size, who uprooted crops and killed anyone and everyone they encountered. To rid the countryside of these beasts, the king offered their slayer the hand of his daughter, the Castle of Loughmoe and the vast lands around it. After all other hunters had tried and failed, a young man named Purcell set out to stalk the beasts. He made his way through the forest by leaping from branch to branch, until he finally reached the spot where the creatures lay. With his bow he peppered them with arrows from above, but to no avail. Finally, two of his shots went into the mouths of beasts, who fled in pain and terror. They were later found dead near Thurles, and Purcell claimed his generous prize. The area in which the castle stands is known as ‘the field of the reward,’ referring to the Purcell’s royal rewards, and the legend is alluded to in the Purcell family coat of arms, which depicts the heads of four boars. The true story of how the Purcell family came to Loughmoe is less romantic. Hugh Purcell accompanied Strongbow’s army to Ireland in 1169. 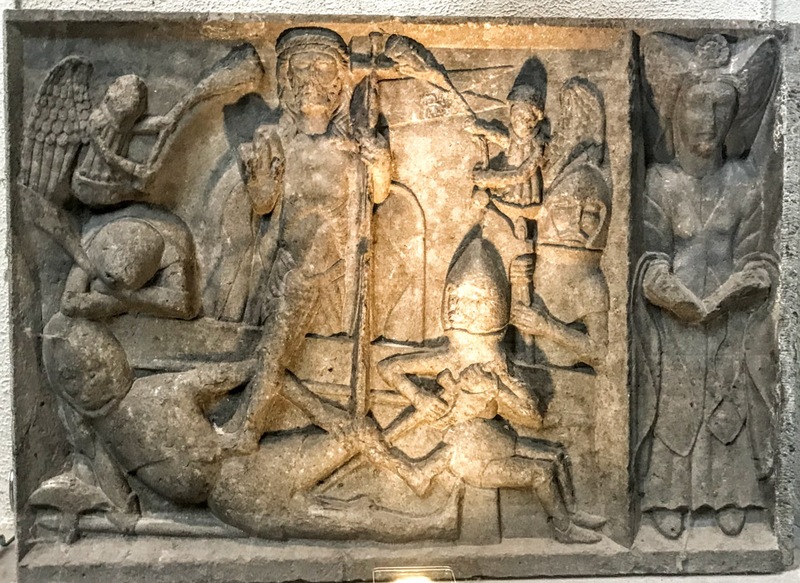 Shortly before 1200, his son, also Hugh, arrived in Loughmoe. Through his marriage with a member of the Butler family, Hugh acquired lands in Loughmoe. Sir Hugh Purcell founded a Monastery of Franciscans or Grey Friars in Waterford in 1241. After the Butlers established the Palatinate of Tipperary in 1328, the Purcells were created ‘Palatinate’ Barons of Loughmoe. It was not a peerage title, but more of an hereditary honorific, like the titles of the Knights of Glin and the Knights of Kerry, or the supposed title of Baron of Danganmore associated with the Comerford family. Loughmoe Castle is situated between the railway line and the River Suir. ‘The magnificent remains,’ as John O’Donovan described them in 1840, comprise an earlier tower-house and a later mansion house. Although it looks like one large castle, it is actually a 15th century tower house to which a 17th century fortified house has been added, which makes it look like an H-plan house. Loughmoe Castle is four storeys high in the middle block, with an attic and semi basement, while the newer towers at either end are five storeys high. The roof probably had dormer windows that provided light for the top rooms. There are many mullioned windows, each containing six, eight or 12 panels. The castle has some fine, large fireplaces, of which the most ornate and interesting are on the first floor of the old tower. This has a moulded stone frame with leaf-work carving and two shields at each end. Two of these are defaced, but the other two depict the heraldic arms of the Purcell and Butler families, who intermarried on several occasions over the generations. The tower house was much modified in keeping with the later 17th century portion, but it can be clearly identified with its rounded corners, gun loops and machicolations. It is said there is a hidden prison chamber on the top floor. The basement floor is now missing but the level of the floor can still be made out. During the Jacobite and Williamite wars in the late 17th century, the Purcells sided James II and the last Baron of Loughmoe, Nicholas Purcell (1651-1723), fought at the battles of the Boyle and Aughrim and signed the Treaty of Limerick. He did not flee Ireland, unlike other ‘Wild Geese,’ after the wars, but chose to stay in Ireland. Because of their support for the 1641 rebellion and the Jacobite cause, the Purcells temporarily lost their estates. However, on each occasion, they succeeded in regaining Loughmoe Castle, possibly because of their kinship with the Ormonde Butlers. The wealth and influence of the Barons of Loughmoe waned during the early 18th century, and considerable portions of the estate were sold to meet mounting debts. The last Baron of Loughmoe, Nicholas Purcell, was a maternal nephew of James Butler, 1st Duke of Ormonde. Nicholas died without male heirs on 24 March 1723, and the estate was divided between his sisters and daughters. The Purcell-Whites were the last to live in Loughmoe Caastle, and remained there until about1760. The English composer Henry Purcell (1659-1695) is said to be related to the Purcell family of Loughmoe. He was the son of Henry Purcell, who is said to have been born in Ireland, and the grandson of Thomas Purcell of Gortanny and Ballyross, Co Tipperary. The Loughmoe part of the estate was sold to the Goolds in 1787, then parts of it to George Adair in 1857, to the Cardens in 1875 and then under the 1923 Land Act to the Land Commission. The Land Commission conveyed the freehold on favourable terms to former tenants. 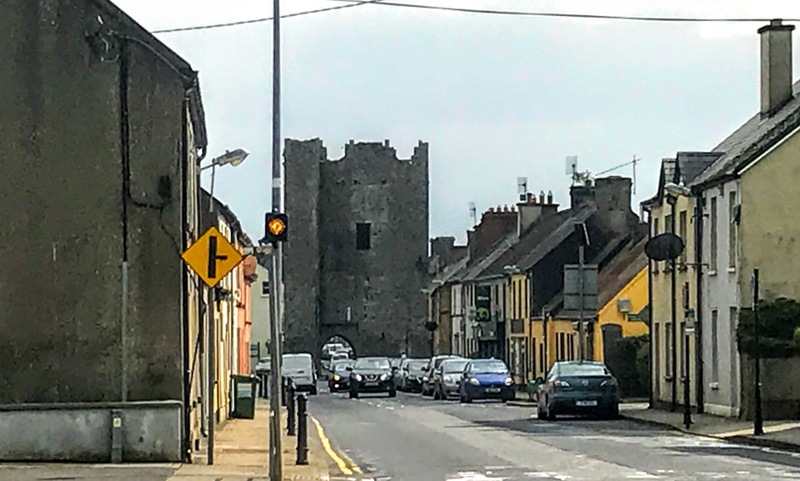 Loughmoe Castle is now in the care of the Office of Public Works. 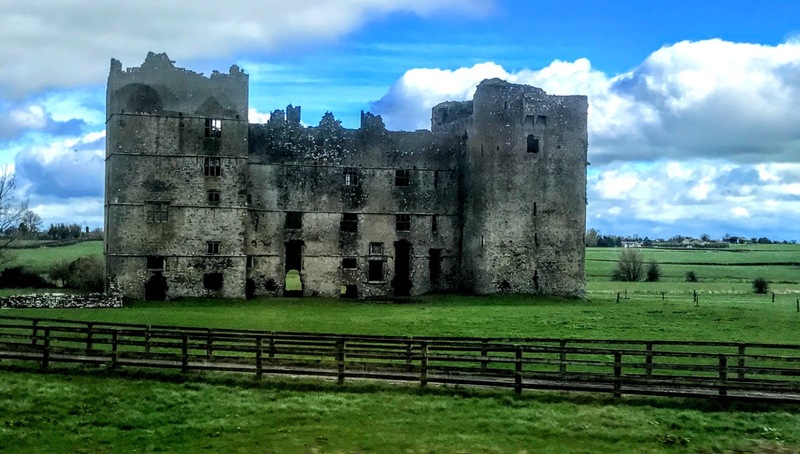 I am particularly interested in Loughmoe Castle because my direct ancestors include Mary Purcell, a daughter of Thomas Purcell of Loughmoe Castle, and her husband, Richard Comerford ‘fitzThomas’ (1564-1637), of Ballybur Castle, Co Kilkenny. Richard Comerford’s first wife was Joanna Sweetman, daughter of John Sweetman of Castle Eve, Co Kilkenny, and aunt of William Sweetman of Castle Eve, executor of Richard Comerford’s will with John Purcell of Crannagh Castle, Co Tipperary. She was alive when Thomas Comerford died in 1589, but she died without having any children. Richard Comerford of Ballybur Castle then married his second wife Mary, a daughter of Thomas Purcell (1538-1609) of Loughmoe Castle. Richard’s will, dated 21 April 1637, was witnessed by his first cousin, Richard Comerford of Danganmore, Peter Rothe, Walter Butler and James Purcell, his brother-in-law. He died on 15 June 1637, aged 73, and was buried according to his will in Grange Church, near Desart, Co Kilkenny. Richard and Mary Comerford had three sons and eleven daughters. Their second but eldest surviving son, John Comerford (ca 1598-ca 1667), who inherited Ballybur and the other family estates. John was the last Comerford to live at Ballybur Castle and, despite his kinship with the Ormonde Butlers, and unlike the Purcells of Loughmoe, he never recovered his castle and estates after the wars and po9litical turmoil of the 1640s and 1650s. He is my direct ancestor through his descendants who moved first to north Co Kilkenny and then to north Co Wexford. Nestled in a wooded vale in Co Clare beside the tumbling waters of the River Inagh in Ennistymon, it is difficult to visualise how the Falls Hotel hides within its walls an 18th century mansion, a late medieval castle, and a history of four or five centuries that tells of clans and warfare, disputes between landlords and tenants, and visiting poets, dreamers and entrepreneurs. 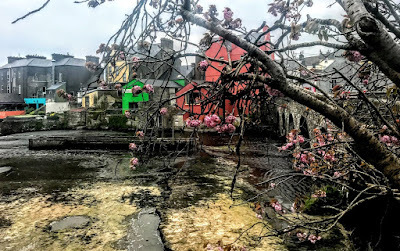 Ennistymon Castle may have been built ca 1560 by Sir Domhnall O’Brien, although there is a suggestion that an earlier castle may have been built by Donough MacDonall O’Conor of Corcomroe, who also built Dough Castle in nearby Lahinch. 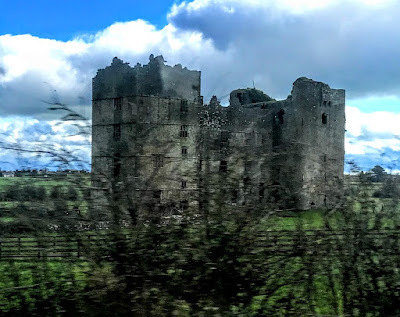 It seems all the O’Connor properties in the area passed to Turlough O’Brien in 1582, although Ennistymon may have remained an O’Connor castle for a short time after. However, Sir Domhnall is O’Brien founded the branch of the O’Brien family at Ennistymon Castle. Sir Domhnall was Governor of Clare in 1576 and died in 1579. His son, Sir Turlough O’Brien, became High Sheriff of Clare. Another son, also Domhnall O’Brien, was nominated as Church of Ireland Bishop of Killaloe, but never took office. At one time, Sir Turlough O’Brien owned over 2,000 acres in the area, including the castle at Ennistymon. In 1588, at the height of the Spanish Armada, he was given permission to arrest and torture any Spaniards found in the country. 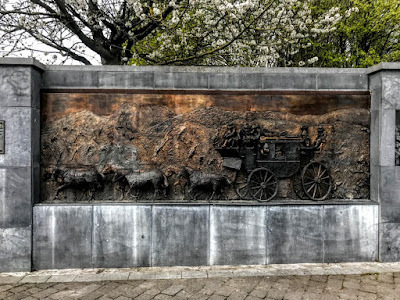 On the other hand, his son Tadhg O’Brien joined the rebel forces of Red Hugh O’Donnell, and was mortally wounded after a large-scale local skirmish. During the Confederate War, in 1645, Sir Daniel O’Brien of Ennistymon Castle was appointed to organise an exchange of prisoners with the commanders of English troops in Connacht. After that war, the Earl of Thomond leased Ennistymon Castle to Neptune Blood in 1656. Three years later it was let to Edward Fitzgerald. Thomas Moland’s survey in 1703 describes Inishtimond as having a manor, a good castle and a two-storey house, all in good repair. Christopher O’Brien died in 1743 and was succeeded by his eldest surviving son, Edward O’Brien. He became a member of the Church of Ireland in 1755. In 1764, Edward O’Brien, a descendant of the original Domhnall O’Brien, demolished much of the old castle building. By the late 19th century, few traces of the castle could still be seen. The castle was rebuilt as Ennistymon House, a Georgian-style building with large sash windows, fine panelling and rococo decoration inside. It was a two-storey, seven bay house over a basement, on a mound facing east towards the Ennistymon falls, with a central one-bay pedimented breakfront, containing a side and fan-lit front door, and a lunette above the second storey window. A yard and stabling stood some distance to the north-west. The house passed to Ann O’Brien and her husband, Matthias Finucane, in 1792. A year later, Ann was divorced by her husband by a special Act of Parliament. But because she was deemed to be the ‘guilty party,’ Ennistymon House remained in the Finucane family. The Finucane family continued to live at Ennistymon House throughout the early 1800s. When Andrew Finucane died without heirs in 1843, the house passed to his brother-in-law, Major William Nugent Macnamara (1775-1856) of Doolin, who had married Susannah Finucane in 1798. She, in turn, was a granddaughter of Edward O’Brien, formerly of the Ennistymon House. Susannah died at the age of 39 years after giving birth to six children. William Nugent Macnamara had a distinguished career. He was a major in the Clare Militia, a Justice of the Peace and High Sheriff of Co Clare. He was also a noted marksman and duellist, and he acted as second to Daniel O’Connell in his duel with John d’Esterre in 1816. The Catholic Association had originally selected Major Macnamara as its candidate for the Clare byelection of 1828. However, he declined for family reasons, and it was only then that Daniel O’Connell was chosen and in turn enjoyed a famous victory that would prove a turning point in Irish history. Perhaps unusually for his time, Macnamara never remarried, and he died in 1856 at the age of 81. His obituary described him as ‘the poor man’s magistrate,’ and his funeral to the family vault in Doolin was one of the largest ever seen in Co Clare. Colonel Francis Macnamara (1802-1873) was the only son and heir of William Nugent Macnamara, was born in 1802. He was a captain in the 8th Hussars and a lieutenant-colonel in the Clare Militia. He was MP for Ennis (1832-1835) and was also High Sheriff of Co Clare. His uncle was Admiral Sir Burton Macnamara, who died in 1876. He married Helen McDermott of Dublin in 1860 and they lived between London and Ennis until 1863, when they made their home at Ennistymon House. They added a west wing to the house to accommodate guests who came to enjoy the shooting and fishing. Colonel Francis Macnamara renovated Ennistymon House, developed parts of the town, and was responsible for giving Ennistymon its distinctive appearance. In 1876, the Macnamara estate included 15,000 statute acres in Ennistymon, Liscannor, Doolin, Fanore, Ballyvaughan and Carron, with about 700 tenants paying a yearly rent of almost £10,000. Colonel Francis Macnamara’s eldest son, Henry Valentine Macnamara (1864-1925), was born two years before his parents moved into Ennistymon House. He was educated at Harrow and Trinity College Cambridge, where he graduated BA in 1882. He was a captain in the Royal Carmarthen Artillery Militia and later a lieutenant in the Clare Militia. He also became a justice of the peace, and High Sheriff of Clare in 1885. In 1883 ‘Henry Vee’ (as he was commonly known) married Edith Elizabeth Cooper, an Englishwoman of Australian descent. He lived at Ennistymon House during the Land War, and relations between landlord and tenant were not always amicable. Later, during the War of Independence, Henry Vee and others were ambushed near Leamaneh Castle in 1919, and he suffered gunshot wounds to his face and arms. Three years later, in 1922, the IRA told Henry Vee that it was ‘confiscating’ Ennistymon House. The family home in Doolin was burned to the ground. Henry Vee reluctantly left Ennistymon and never returned. He died in London in 1925 at the age of 64. A short time after Henry Macnamara left, Ennistymon House became a temporary barracks for the new police force, the Garda Siochana. 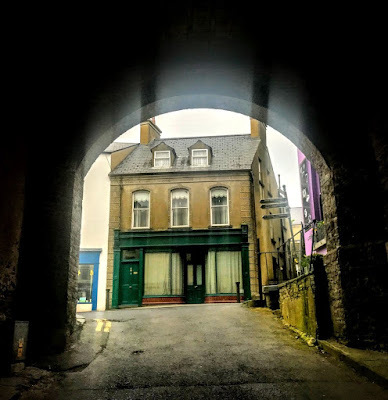 Henry Valentine Macnamara’s eldest son, Francis Macnamara (1884-1946), was responsible for turning Ennistymon House into a commercial property for the first time. At an early stage in his life, he turned his back on a career in law for the bohemian lifestyle of London and in 1909 published a collection of poems, Marionettes, some inspired by his home in Ennistymon. He secretly married Yvonne Majolier in 1911 and they lived together in London. They were the parents of a son, John Macnamara, and three daughters, Nicolette, Brigit and Caitlin. One daughter, Nicolette Devas (1911-1987), described her unusual childhood in Two Flamboyant Fathers (1966), a memoir full of anecdotes about celebrated figures such as WB Yeats and TE Lawrence. Her sister, Caitlín (1913-1994), married the Welsh poet Dylan Thomas (1914-1953), with whom she had a fiery alcohol-fuelled relationship in London, Ireland, Wales and the USA, spending her last years in Italy. Francis and Yvonne spent some of their honeymoon in Doolin, and returned many times with other writers and artists, including Augustus John, George Bernard Shaw, JM Synge and Oliver St John Gogarty. The marriage of Francis and Yvonne broke down and in 1928 he married Augustus John’s sister-in-law, Edie McNeil. 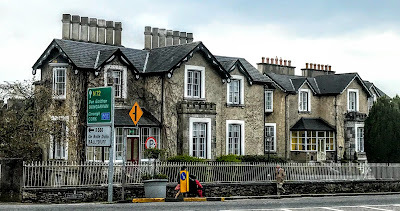 At the time, he had plans o turn the family home at Ennistymon House into a country hotel. After Edie died, Francis married his third wife, Iris O’Callaghan-Westropp of O’Callaghan’s Mills, in 1936. He was then 52, some 30 years her senior, and shortly after they both returned to Ennistymon House which they opened as the Falls Hotel. Although guests appreciated Francis Macnamara’s, generosity, his hotel management skills were unprofessional. At the end of the 1930s, he leased the hotel for five years to Brendan O’Regan, who later pioneered catering and sales services at Shannon International Airport. 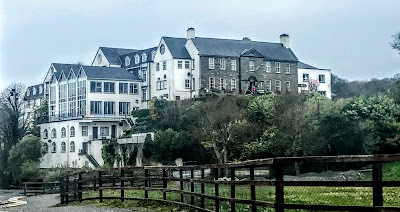 O’Regan ran the hotel during World War II, and Francis and Iris moved into a small house – known as the ‘Henrun’ or the ‘Chateau’ – behind the hotel. When Brendan O’Regan’s lease ran out, Francis decided to sell the hotel, bringing to an end an almost unbroken connection that stretched back over 400 years to the original O’Briens of Ennistymon Castle. Francis later died in 1946 at the age of 62. 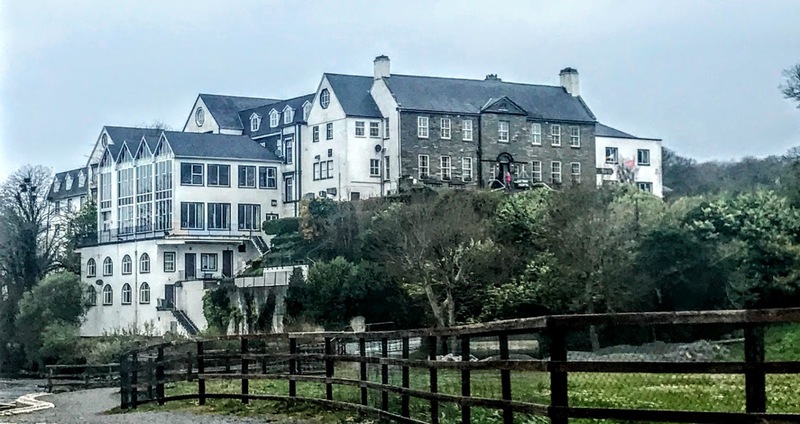 The new owner of the Falls Hotel was a retired Welshman, Gerard Henry Williams-Owen, but he and his family only ran the hotel during the summer months. When John F Wood and his wife Bridget acquired the hotel in 1955, they added a hydroelectric plant that for many years provided power to the building, and the plant can still be seen a short distance upstream, just below the cascades. Later, John F Wood’s son Tony and his wife Meg ran the hotel for some years. The current owners of the Falls Hotel are Dan and Eileen McCarthy. The hotel has been extended and improved, and now has 150 bedrooms, a restaurant and bar, and a 400-seat conference and banqueting room. The Cascades or the Falls are one of the finest features in Ennistymon. They can be viewed from the bridge or from the footpath walk that can be entered through the archway leading off Main Street and along the riverside walk to the Falls Hotel. This stretch of the river, from the bridge to the deep water near the Falls Hotel, is a popular trout and salmon fishing beat, especially when the river is in flood. Favourite pools by the Cascades were known as Tuneys, the House, the Big Rock, the Salmon Hole and the Eel Hole. 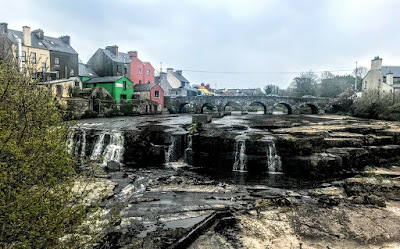 The Bridge at Ennistymon is a seven-arch rubble stone road bridge built over the river ca 1790. The Board of Fisheries built a fish pass on the river in 1961 to allow salmon to migrate upstream to breed. Before the busy period of Holy Week and Easter arrive, I spent a quiet Saturday afternoon in Ennistymon, a colourful and pretty town in north Clare, walking by the Cascades and the banks of the River Annagh and the Cascades, enjoying the colourful shopfronts and cafés, learning about the story of the town’s former castle, and visiting three churches and their sites. In the ecclesiastical divisions of the Church of Ireland, the parish of Ennistymon has been part of the ancient Diocese of Kilfenora. The parish church, Saint Andrew’s, has been closed for decades, and the parish is now part of the Drumcliffe Group of Parishes based in Ennis. 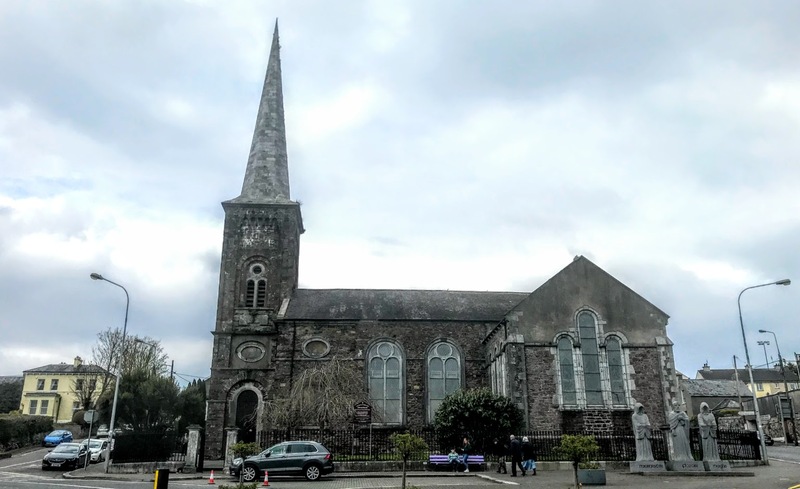 But the town remains of interest to anyone engaged with the history of the Church of Ireland in the Diocese of Limerick and Killaloe. Teach Ceoil at the top of Church Street in Ennistymon is the former Saint Andrew’s Church. This is a three-bay, double-height Gothic Revival church, built in 1830-1831, with a central octagonal-plan two-stage entrance tower. The octagonal tower was added shortly after, built by the same masons. 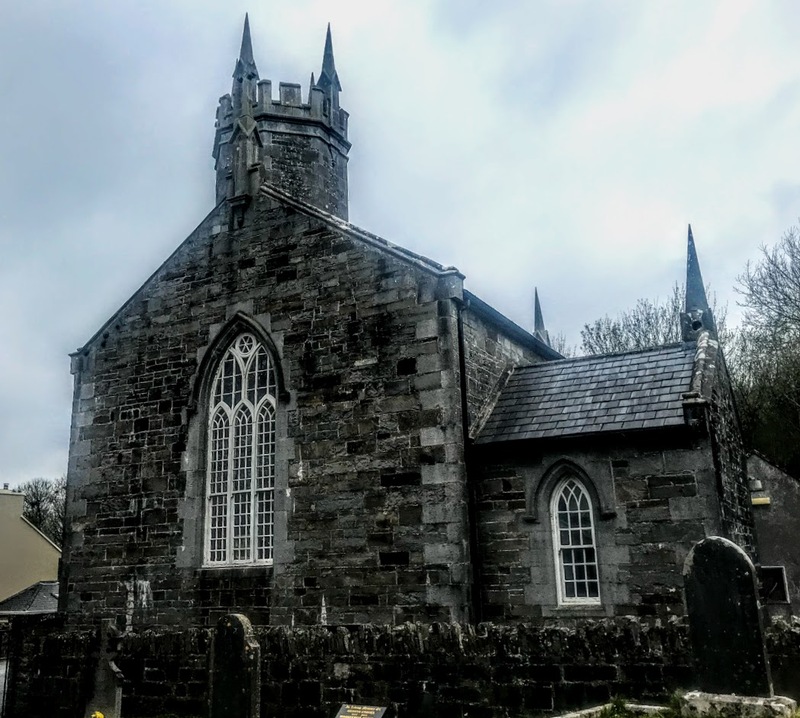 Saint Andrew’s Church was built by the Ven John Whitty (1779-1864), Archdeacon of Kilfenora and previously Rector of Kilrush, with a grant of £1,000. He was born in Kilrush, Co Clare, the son of the Revd Irvine Whitty (1754-1842). 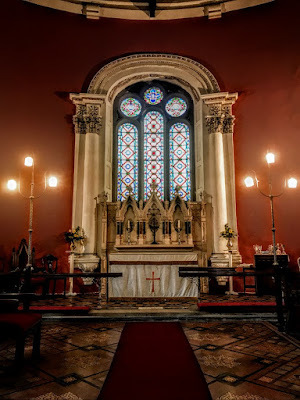 Three successive generations of this branch of the Whitty family were priests in the Diocese of Kilfenora: the Revd Irvine Whitty (1754-1842), Archdeacon John Whitty (1779-1864) and Canon Henry Whitty. Archdeacon Whitty was educated at Trinity College Dublin, graduating BA in 1800. He was Rector of Kilmanaheen (Ennistymon), Archdeacon of Kilfenora from 1822, a local magistrate (JP), and lived at the Glebe House in Ennistymon. Archdeacon Whitty died at Cotham park, his son’s house in Bristol, in 1864. Henry Valentine Macnamara of Ennistymon House installed the clock in the tower in 1900 in memory of his father, Colonel Francis Macnamara. Saint Andrew’s was always known by the people of Ennistymon as the ‘New Church.’ It only ever had a small congregation. Sunday services ceased in the 1960s. 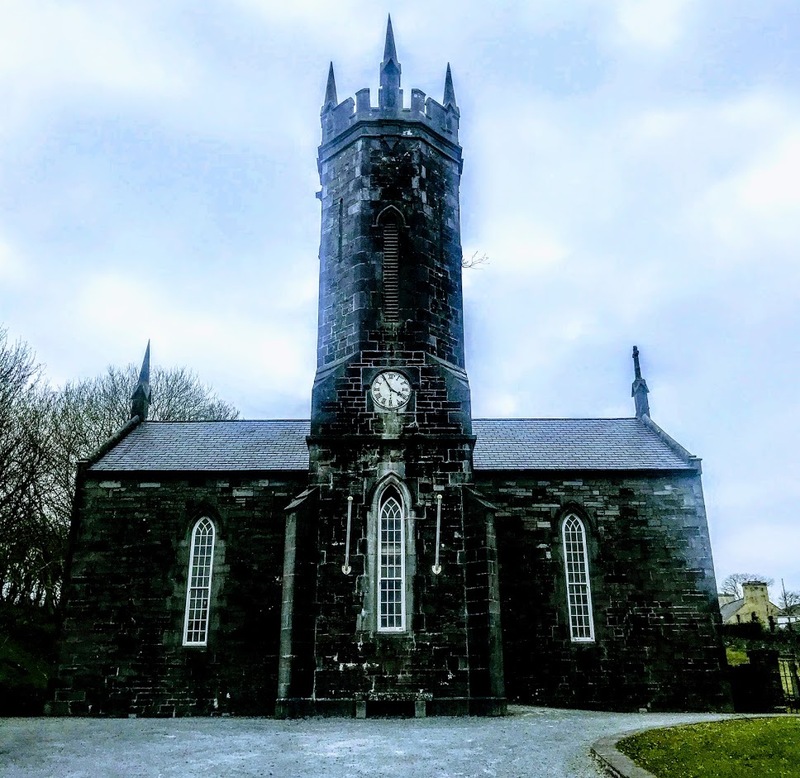 Saint Andrew’s was deconsecrated in 1964, and in 1986 the church was given by the Representative Body of the Church of Ireland to the local branch of Comhaltas Ceoltoiri Eireann in 1986. Since 1989, the church is now known as An Teach Ceoil (the House of Music). Inside, the church still has many of its original features, including brass and marble memorial plaques, a timber carved pulpit and the pews. To the right of the entrance is a monument to Brian Merriman (1747-1805), the Ennistymon-born poet who wrote Cúirt an Mhéan Oíche, the epic poem that has been translated into The Midnight Court, and is a cultural centre for Irish music, dance and song. 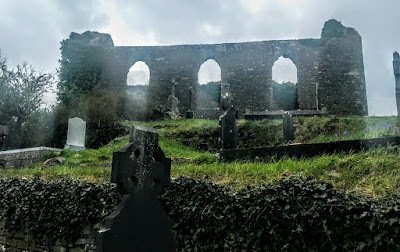 The first church in the parish is said to have been at Kilmanaheen, north of Ennistymon, where Saint Mainchin built a church ca 580 AD on the dún or residence of Baoth Bronach, King of Corcomroe. Saint Manchin’s Church is now a barely discernible ruin with a graveyard, its old importance long forgotten. Archdeacon Whitty’s ‘New Church’ replaced the ‘Old Church’ built above the town on the summit of Church Hill in 1775-1778. 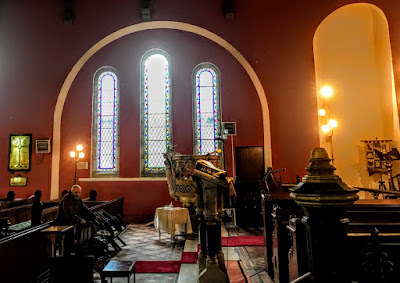 The nave-and-chancel church was built in 1775-1778 by the Ven James Kenny, Archdeacon of Kilfenora and Rector of Ennistymon. It features a single Gothic door, three windows on the north and one on the east side, and measures 14 by 7 meters. 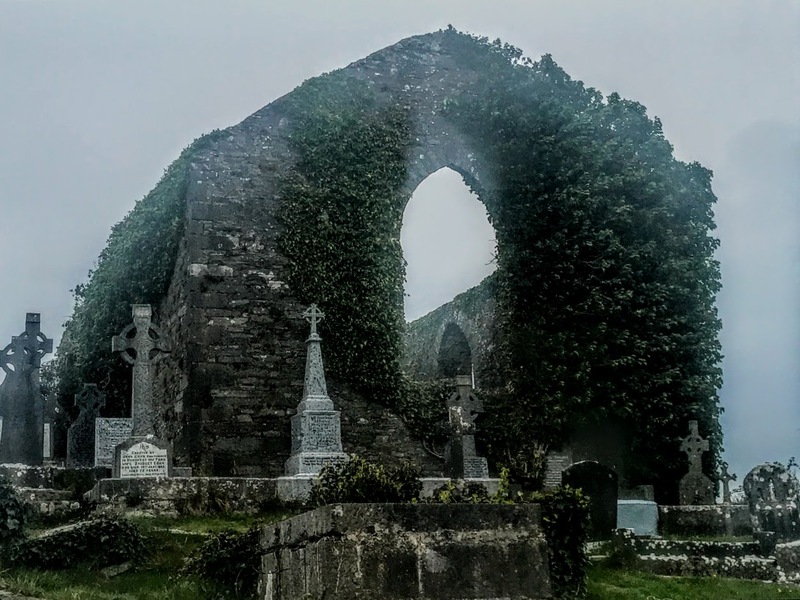 Archdeacon James Kenny left the Roman Catholic Church and was appointed the first Church of Ireland Rector of the parish of Kilmanaheen, the ecclesiastical name of Ennistymon. Kenny received a grant of £390 to build a church on this prominent site and the church was completed in 1778. In his 45 years in the parish, Kenny was a controversial rector and lived in fine circumstances in the glebe at Kilmanaheen outside the town. During his time, it is said, 45 local Roman Catholics joined the Church of Ireland. The church was damaged in 1798-1799 during the United Irish rebellion, and the doors and windows of the church were smashed. This was a church with an unadorned nave and chancel. It fell into ruin soon after Archdeacon Whitty built Saint Andrew’s Church in 1831. The graveyard was originally used by Church of Ireland parishioners, but during Kenny’s time there were only two burials, and they were members of the Finucane family, former residents of Ennistymon House. 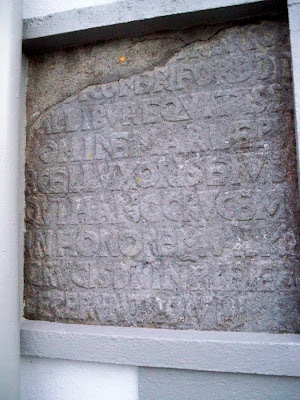 The inscribed slabs on the Finucane tomb date from 1820, and are of local interest. After 1829, the churchyard was used for Roman Catholic burials. 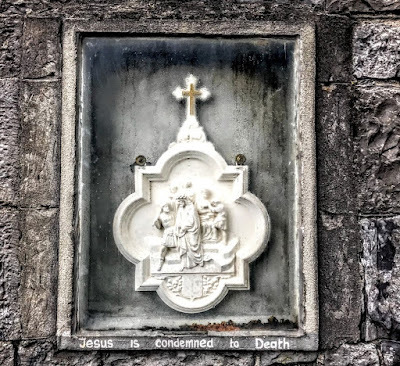 Several Christian Brothers from Mount Saint Joseph Monastery are buried there in graves marked by small black crosses with their names traced in Irish. 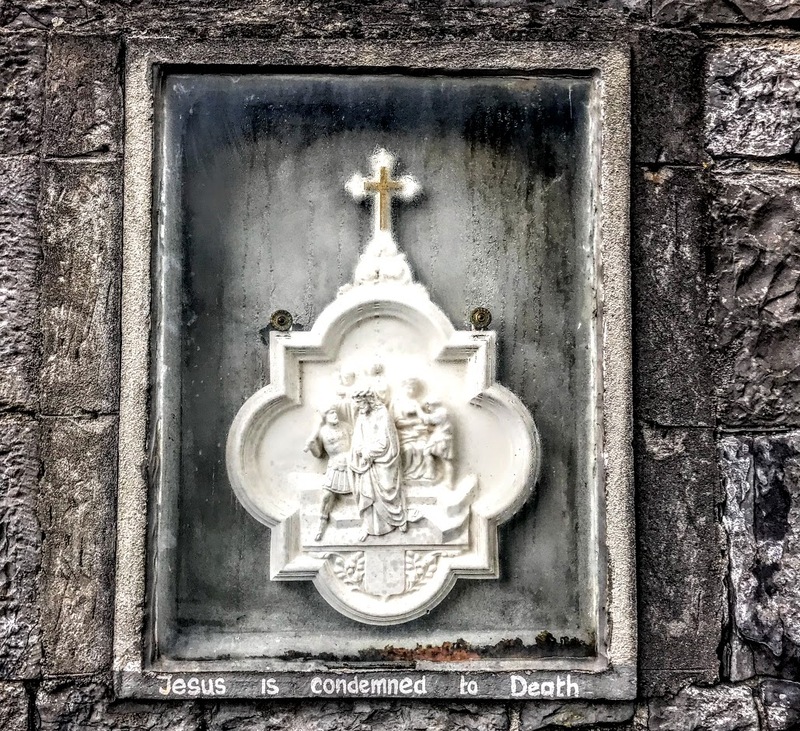 Twenty years ago, the North Clare War Memorial Committee erected a plaque on the walls of the churchyard in memory of men and women from Ennistymon and North Clare who fought and died in World War I, and who fought and died in all previous and later wars. The church and graveyard preside over the town from their grassy eminence. Here the views over the town of Ennistymon and the surrounding countryside of north Clare and out across Lahinch to the Atlantic are spectacular. In the Roman Catholic arrangement, the Diocese of Kilfenora was amalgamated with the Diocese of Galway in 1866. An older 19th century church was replaced in the mid-20th century by the Church of Our Lady and Saint Michael on Lahinch Road, built in 1948-1954. 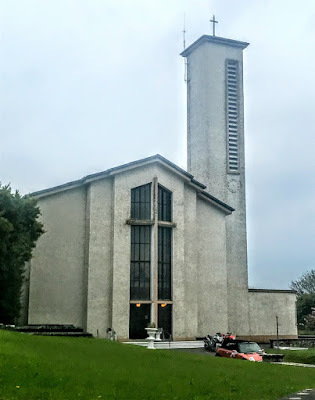 This was one of the first modern designed churches built in Ireland, a decade before Vatican II, and opened on 8 December 1954. It was designed by the architect Frank Corr to seat 1,000 people, and the contractors were Farmer Brothers. It includes a stepped central breakfront, a single-bay four-stage bell tower, a bowed-ended baptistery, eight-bay nave elevations, an eight-bay single-storey side aisle, a pitched copper sheeted roof, full-height timber windows at the glazed entrance bay, with a concrete mullion and transoms forming a Cross. An interesting feature of the church is the Stations of the Cross, painted in frescoes by the Dominican artist Aengus Buckley OP in 1955. One of the stained-glass windows in the south transept of Christ Church, the Church of Ireland parish church in Fermoy, commemorates Sir George Samuel Abercromby (1824-1872). The Abercromby family estates were mainly in Birkenbog and Forglen in Scotland, and the main family seat was Forglen House, north-west of Turriff in Aberdeenshire. But the family also had large estates in Ireland. In the early 19th century, Sir George’s father, Sir Robert Abercromby (1784-1855), bought most of the town of Fermoy when his fellow Scotsman John Anderson (1747-1820), went bankrupt before he died. 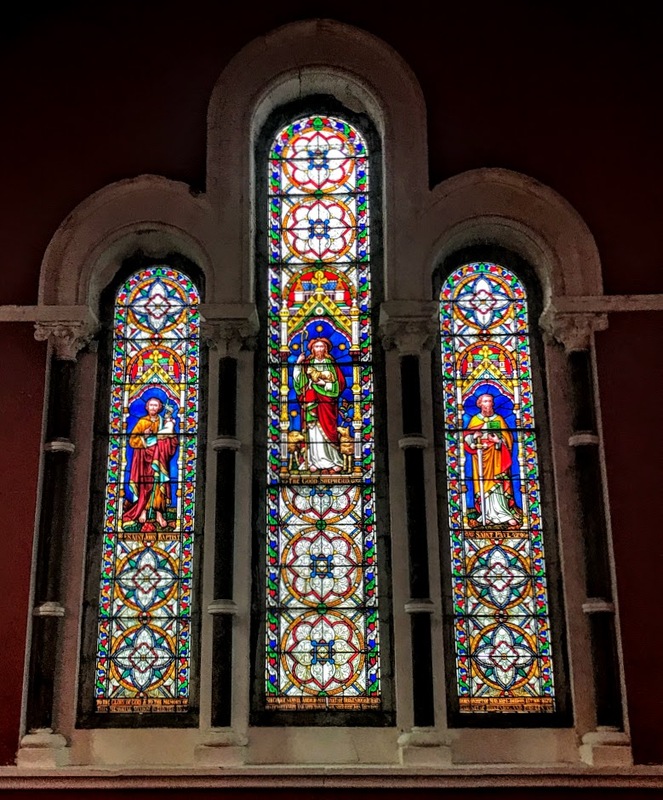 Sir George’s son, Sir Robert John Abercromby (1850-1895), who placed this window in Christ Church, owned Fermoy House and 434 acres of land in Co Cork in the 1870s. His mother, Agnes Georgina Browne, Lady Abercromby, who is referred to on the window without being named, was a daughter of John Cavendish Browne (1794-1873), 3rd Baron Kilmaine, of Gaulstown House, Co Westmeath. The Abercromby family also gave their name to Abercromby Place in Fermoy, a pair of Tudor revival houses built ca 1850 that form an imposing feature on the Fermoy streetscape, facing the entrance to Fermoy House and standing on the east side of the street, between Christ Church and the bridge over the River Blackwater. One house is now the offices of James Walsh and Son Solicitors, while Abbeyville House on the south side of this pair is now a guesthouse. They are set back from the street and share a site bounded by rubble stone and rendered walls with cut limestone coping and decorative cast-iron railings. These houses are in a prominent location in the town, and their Tudor Revival style is unusual for urban architecture in Ireland. This makes them an interesting feature on the street of Fermoy. Both houses have been tastefully refurbished using sympathetic materials. Their timber bargeboards are well executed and typical of the style. They add decorative interest to the houses and the form and appearance of the buildings are further enlivened by architectural features such as the oriel windows, crenellated projections and glazed porches. The Tudor Revival style is carried through in the steeply gabled bays and the middle projections. The two houses are linked by a rendered wall with a crenellated parapet and dressed limestone coping and cornice, and triangular-headed openings to each end with a timber panelled door and a dressed limestone cornice above. 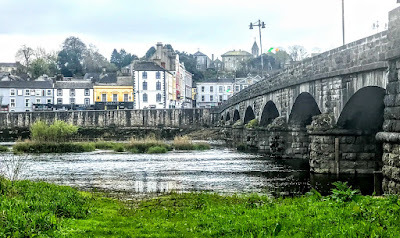 Closeby, the River Blackwater is crossed by Fermoy Bridge, a seven-arch limestone road bridge first built on the site of late 16th and 17th century bridges that replaced a mediaeval ferry. Abraham Addison Hargreave, the architect who designed Christ Church in 1809, was commissioned by John Anderson, who built Fermoy Town, to widen the 1689 bridge about the same time as the church was built. His grandson, Joshua Hargreave, rebuilt the bridge in 1864-1865 to a design by the railway engineer Andrew Oliver Lyons (1827-1902). Until recently, this bridge carried the main Dublin-Cork road. Across from Abercromby Place, the gates of Fermoy House stand at the entrance to Fermoy House, built by Anderson in 1820 but long since demolished. A modern sculpture recalls John Anderson who built and lived in this house in the early 19th century. He also built Christ Church, Fermoy, and was a pioneer in developing stage coach travel in Ireland in the early 19th century. 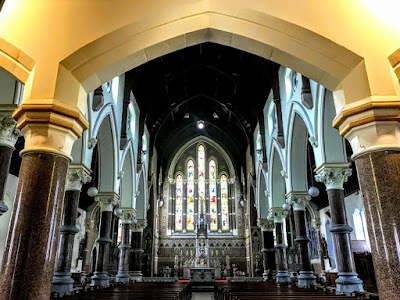 I was in Fermoy in Co Cork, on a recent Sunday afternoon for the institution of the Revd Gary Paulsen as the Rector of Fermoy. Christ Church, Fermoy, is prominently sited on a hill to the north of Fermoy Bridge, and is a notable feature in the townscape. 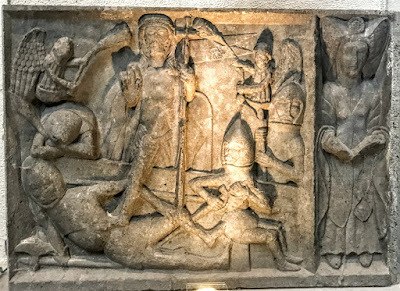 Saint Finnchua founded a monastery at Fermoy in the 7th century. A Cistercian Abbey was founded in 1170 was known as the Abbey of Sancta Maria de Castro Dei (‘Saint Mary of the Field of God’). 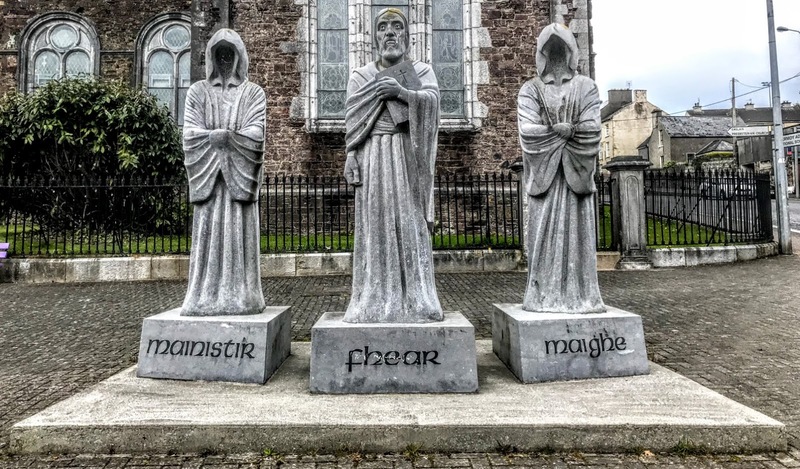 The Irish name of the town, Mainistir Fhear Maí, meaning ‘Monastery of the Welcome Plain,’ refers to the 12th century Cistercian abbey and the ford on the Blackwater around which the town grew up. However, another legend says Fermoy takes its name from a powerful blind druid, Mogh Roith, who was awarded this area for protecting the King of Munster by defeating the druids of the High King of Ireland in a magical battle. The monks built the first weir on the Blackwater at Fermoy, somewhere by Ashe Quay and Abbey Street. Following the dissolution of the monasteries, the abbey lands in Fermoy were granted to Sir Richard Grenville, a cousin of Sir Walter Raleigh, in 1591. As a town, Fermoy is of comparatively recent origin, dating from only 1791, when John Anderson, a Scotsman, bought the Fermoy estate. Anderson was a very successful business man and established the Mail Coach system between Cork and Dublin in 1789. 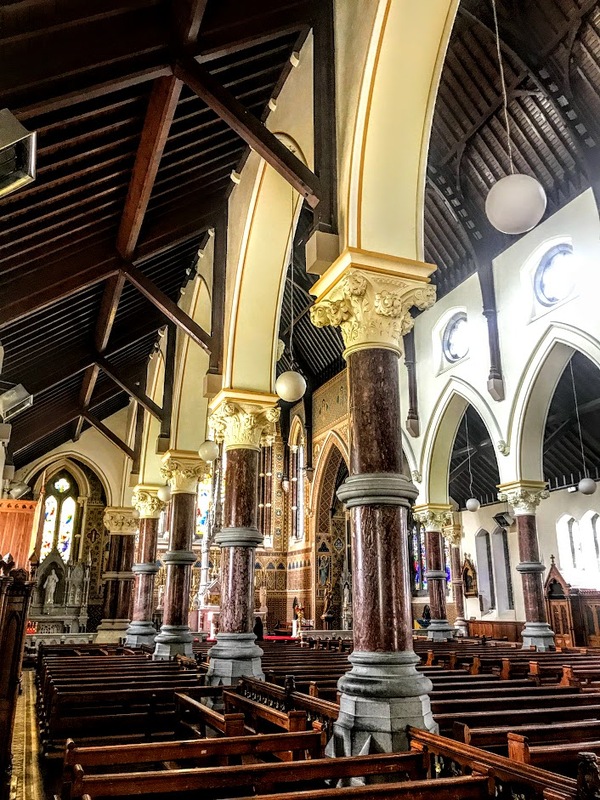 He was a visionary who also recognised the need for churches in his new town and provided financial assistance for building both a Church of Ireland and a Roman Catholic parish church in Fermoy. 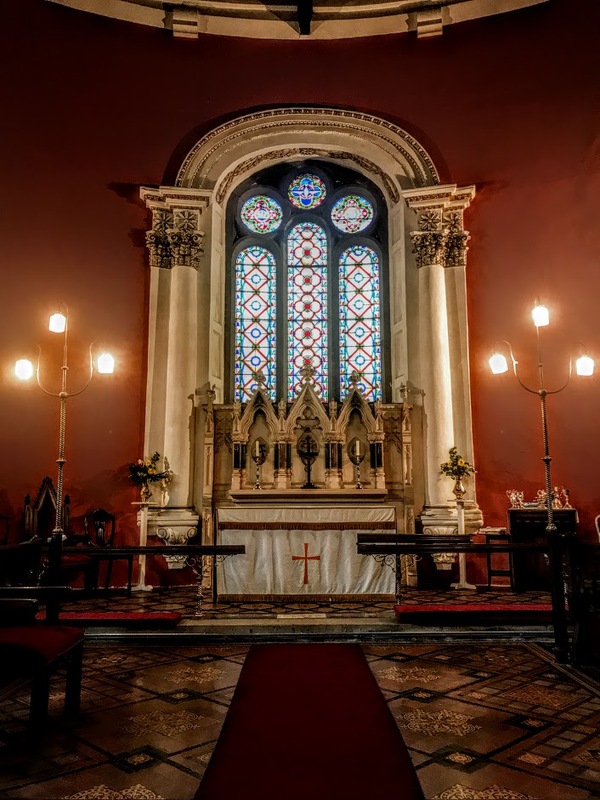 Until then, Fermoy had no Anglican parish church, Litter Church at Castle Hyde was in a state of disrepair, and parishioners attended either Kilworth Church or services conducted by the Revd Dr William Adair either in rooms in private houses or in the open air. Adair applied to the Board of First Fruits to build a new church in Fermoy, Arthur Baylor donated a site on the north side of the bridge crossing the River Blackwater, on the site of the Cistercian abbey. The new church was built at a cost of £3,282, borne by Sir John Anderson of Fermoy and John Hyde of the nearby Castle Hyde estate. Christ Church, which was built in 1802-1809, was designed by Abraham Addison Hargrave (1755-1808), one of Cork’s distinguished architects. Hargrave was born near Horsforth, Leeds, in 1755. He worked in Lancashire before moving to Ireland in 1791 to supervise the erection of Saint Patrick’s Bridge in Cork, which he designed with Patrick Shanahan. Hargrave worked extensively in Cork and was employed on several projects in Fermoy by the town’s enlightened proprietor, John Anderson. His other works in the Fermoy area included the East Barracks, Castle Hyde, bridges at Castle Hyde and Ballyhooly, widening the bridge at Fermoy. Before his church in Fermoy was completed, Hargreave died at Camden Place, Cork, on 20 March 1808 aged 53. 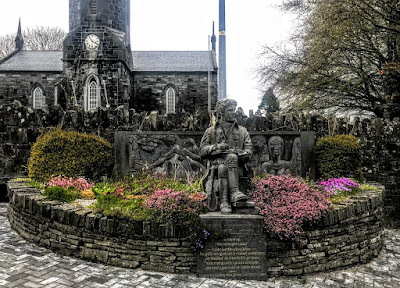 He is commemorated by a monument in Saint Anne’s Church, Shandon. Christ Church was completed the following year and was consecrated on 22 October 1809 by William Bennett, Bishop of Cloyne. The formal dedication was ‘To Our Lord and Saviour, Jesus Christ.’ We can estimate the size of the parish at the time because there were 150 communicants the following Christmas Day. Hargreave’s church was built of Portland stone with a tower and spire. It was designed to accommodate the parishioners of Fermoy and also the large number of military personnel at the nearby barracks, also designed by Hargreave. The church was built with a two-stage entrance tower at the west with a spire, three-bay nave elevations, a bowed chancel at the east, and a two-bay single-storey vestry at the north-west. The tall entrance was made to admit, without dipping, the colours carried on military church parades. The largest number of troops stationed in Fermoy was probably before the Battle of Waterloo in 1815. The Duke of Wellington visited the barracks at that time, and it was from Fermoy Barracks that a very contingent of the troops left fight Napoleon. Another unusual feature by Hargreave was placing the entrance on the south side of the tower as opposed to the west. The spire was added to the tower in the 1820s to replace the original. The pitched slate roofs have a carved limestone eaves course at the main block, and a moulded bracket course and copings with carved kneelers at the transept. Lewis notes that by 1837 the spire had been removed. The steeple was replaced by Joseph Welland by 1858, the south transept was built in 1859-1860, the north transept was added and the chancel was enlarged in 1873-1874, and the first stained-glass windows were installed in 1875. Following storm damage in 1950 and a fire in the roof in 1952, the church was refurbished and rearranged in 1954-1955 and again in 1962-1963. The second stage of refurbishment included the demolition of the north transept. The church walls are of rubble sandstone, partly rendered at the apse, with a moulded limestone string course at the impost level and above the bottom stage of tower. There are rubble sandstone buttresses at the corners of the transept, with dressed limestone quoins. There are oval recessed panels at the tower, east and south walls, and square-headed panels at the south and east walls, all with moulded limestone surrounds. 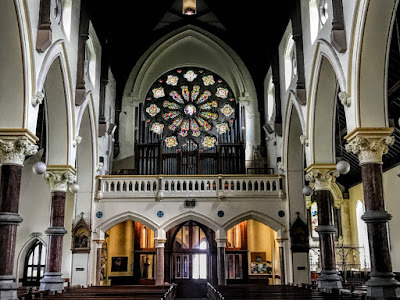 There are round-headed windows throughout the church, grouped in threes on the side walls of the transept, and stained-glass, triple-light in the gable of the transept and in the former north transept arch. The nave windows are two-light and traceried with carved limestone surrounds and sills and with quarry glazing. The chancel has a round-headed traceried triple-light, stained-glass window, where the surround comprises rendered engaged Ionic columns supported by carved limestone console brackets and with a carved limestone archivolt. The vestry has square-headed double-light and single-light round-headed windows. The tower has an oval window on the west side and a round-headed entrance on the south side, approached by limestone steps. Inside, Christ Church retains many of its original features, including the finely carved reredos and the pulpit. 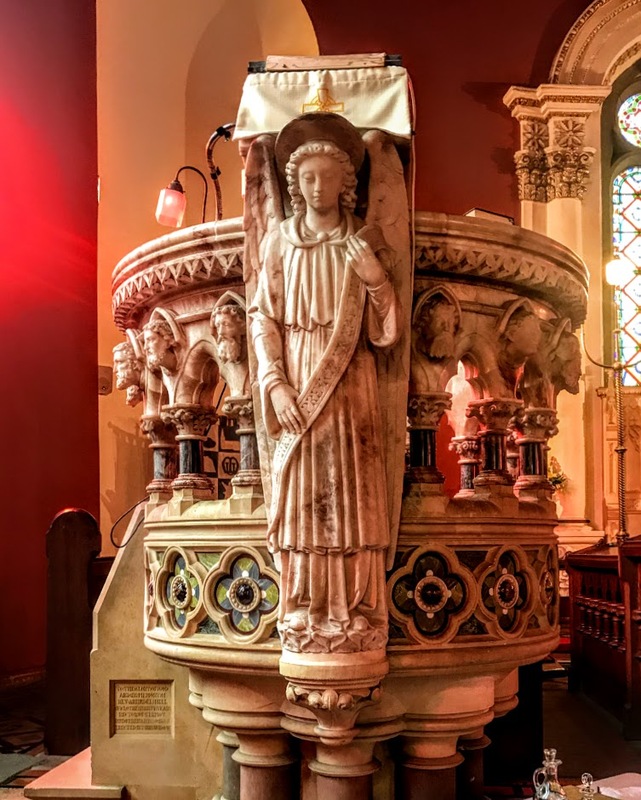 The marble pulpit, with carved faces of the 12 Apostles, was erected in memory of Canon Arundel Hill. Tradition says it was originally designed for an English cathedral, but was never installed there. The timber gallery and the stained-glass windows are of artistic interest. The gallery is supported on timber Ionic columns. The font incorporates a bowl from the Cistercian abbey. The east window in the south transept is by Watson and Son of Youghal and depicts Saint James the Apostle. 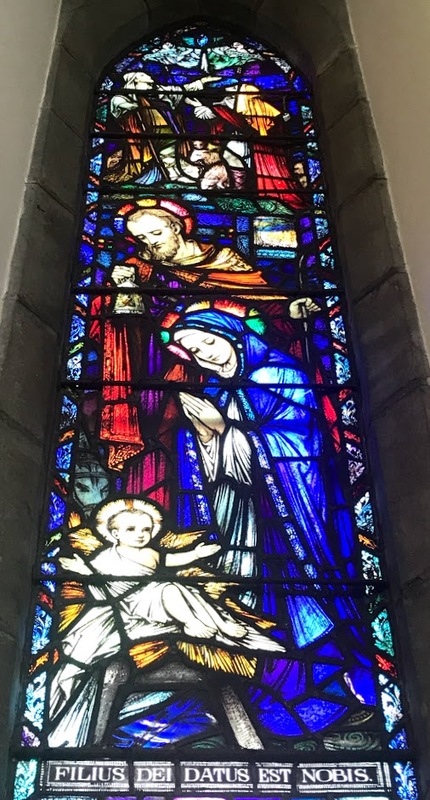 This window commemorates the Revd Frank Stonham (1850-1899), Principal of Fermoy College and a curate in Fermoy Parish 1892-1899. 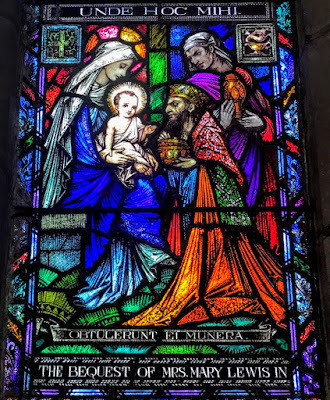 The stained-glass windows in the south transept also include a three-lancet window by William Wailes (1808-1881) of Newcastle-upon-Tyne depicting Christ the Good Shepherd in the centre, with Saint John the Baptist (left) and Saint Paul (right). It was inserted in 1875 by Lady Abercromby and her son Sir Robert John Abercromby in memory of Sir George Samuel Abercromby (1824-1872). Wailes ran one of the largest and most prolific stained-glass workshops in Victorian England. He had studied with Mayer of Munich and later worked closely with AWN Pugin. 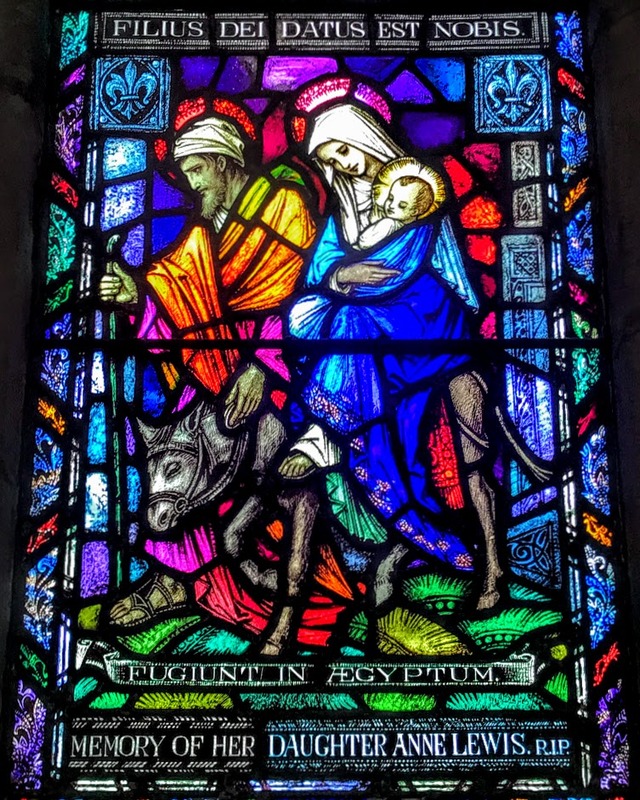 His other works include the windows of Gloucester Cathedral, the East Window in Saint Editha’s Church, Tamworth, the Transfiguration East Window in Saint Saviour’s Dominican Church in Limerick, and windows in Saint Mary’s Church, Killarney. 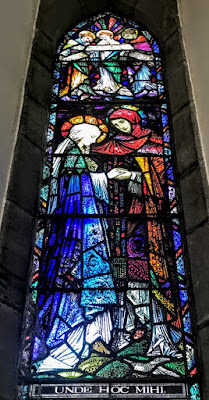 David J Butler and Hazel Baylor, Christ Church, Fermoy, ‘A commanding silhouette’ (Fermoy, 2009). Niall Brunicardi, Christ Church, Fermoy (Fermoy, 1984). 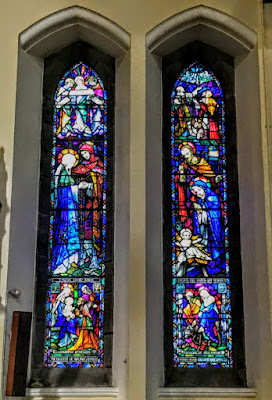 On the way to Fermoy, Co Cork, recently, two of us stopped to visit the Church of Saint Peter and Saint Paul, the Roman Catholic parish church in Kilmallock, Co Limerick. Kilmallock is an impressive walled mediaeval town, just a 30-minute drive from both Limerick City and Adare. But it is often overlooked by many visitors. The church, built in the 1870s and 1880s, stands on a height overlooking the town and has an almost cathedral feel created by its size and its dominant location. This church replaced an earlier church built in 1814 to replace a Penal-era Mass house in the town. The church has fine mosaics, vibrant stained windows, including windows from the Harry Clarke studios, and it is an important example of Gothic Revival church architecture in Victorian Ireland. The Gothic Revival church was one of the last designed by the architect James Joseph McCarthy (1817-1882), who claimed Pugin’s mantle in Ireland, and was completed by Pugin’s son-in-law, George Coppinger Ashlin (1837-1921). McCarthy’s other churches in Co Limerick include: Saint Saviour’s Dominican Church, Limerick; Saint Mary’s Church, Rathkeale; Saint Senanus’ Church, Foynes; the Church of the Immaculate Conception, Ballingarry; as well as Cahermoyle House and Croom House. 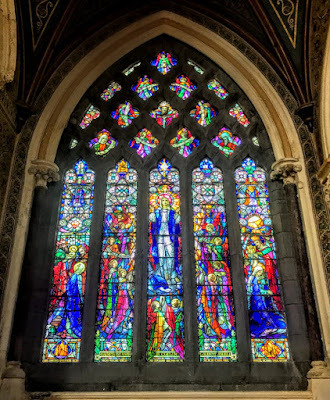 McCarthy completed Pugin’s work at Maynooth and Saint Mary’s Cathedral in Killarney, and his other cathedrals and churches include Saint Aidan’s Cathedral, Enniscorthy, Co Wexford, Saint Macartan’s Cathedral, Monaghan, the Cathedral of the Assumption, Thurles, Saint Colman’s Cathedral, Cobh, the ‘Twin Churches’ in Wexford, Saint Catherine’s Church, Dublin, the Passionist Church in Mount Argus, Dublin and Saint Michael’s Church, Tipperary. 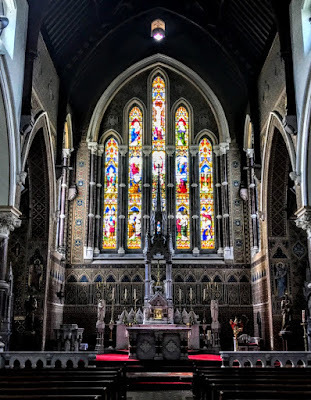 His elaborate, monumental church in Kilmallock is of architectural importance, and it is one of the later churches designed by McCarthy. McCarthy is said to have designed the church to harmonise with the ruins of the mediaeval Dominican priory in the town. When he died in 1884, Ashlin became the architect for the church, and it was completed in 1889. Tenders to build a new church were invited in June 1877, and the foundation stone was laid on 29 June 1879. The contractor was Walsh of Foynes, and the decorative work was completed by Eugene Daly of Cork. The church, which is oriented west/east rather east/west, has a six-bay nave with side aisles, a gable-fronted porch, transepts, a two-bay two-storey sacristy, an inset rose window with carved quatrefoil motifs, timber battened double-leaf doors with wrought-iron strap hinges, and a tall, square-plan four-stage tower with an elegant spire. Inside, there are pointed arch openings, limestone engaged columns, oculi in the clerestory, stained-glass lancet windows and hood mouldings. The pillars of the nave are of red marble, on high limestone bases and ornamented with limestone rings half-way up. They have elaborate, carved capitals and the pointed arches of the nave have linked hood moulds with carved stops. The fine roof is framed and panelled in pitch pine. 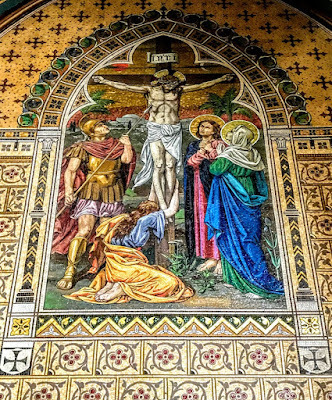 Ashlin’s work in 1887-1893, in 1900, and again in 1910-1911 includes designing the church tower and spire, the benches, the holy water stoup, hinges on the outside doors, the Communion gates, the Baptism Font, the baptistry screens and mosaic work, as well as the High Altar, Communion rail, mosaic pavement, two side altars, a new sacristy, and the tower and spire. 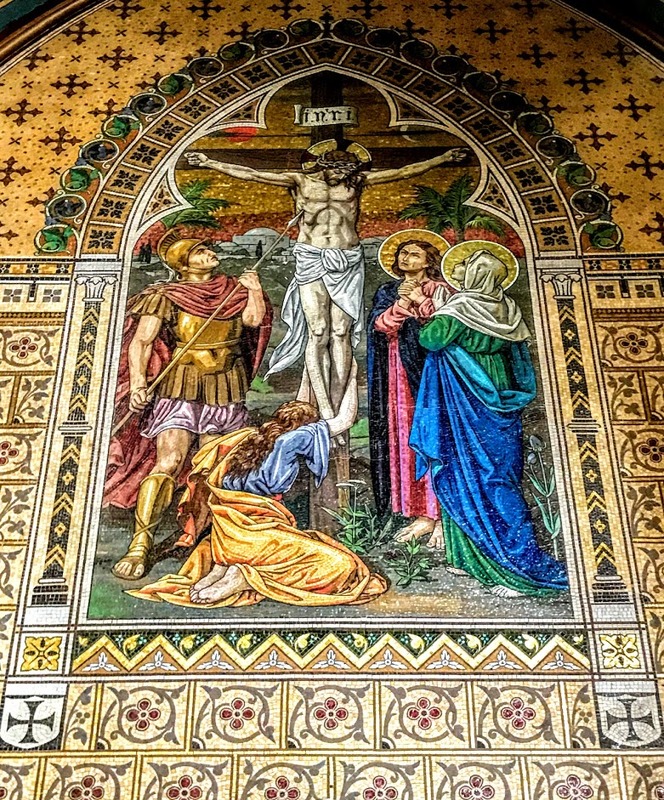 The High Altar and interior carvings were the work of Edmund Sharp, and Ludwig Oppenheimer carried out the mosaic work in sanctuary and side chapels, including the striking Crucifixion mosaic with its bright blue sky, ornamented with gold stars. The present altar was made from the remains of the original altar. The central pinnacle has been retained as a freestanding tabernacle flanked by a pair of dislodged marble angels. Most of the stained-glass windows were designed by Mayer of Munich and Earley of Dublin. The design of the chancel window was inspired by the chancel or east window in the ruined Dominican priory church. One pair of lancet windows has stained-glass designed by the Harry Clarke studios, depicting four scenes: on the left the betrothal of Saint Joseph and the Virgin Mary (top) and the Visit of the Magi (below); and on the right the Nativity (top) and the Flight into Egypt (below). 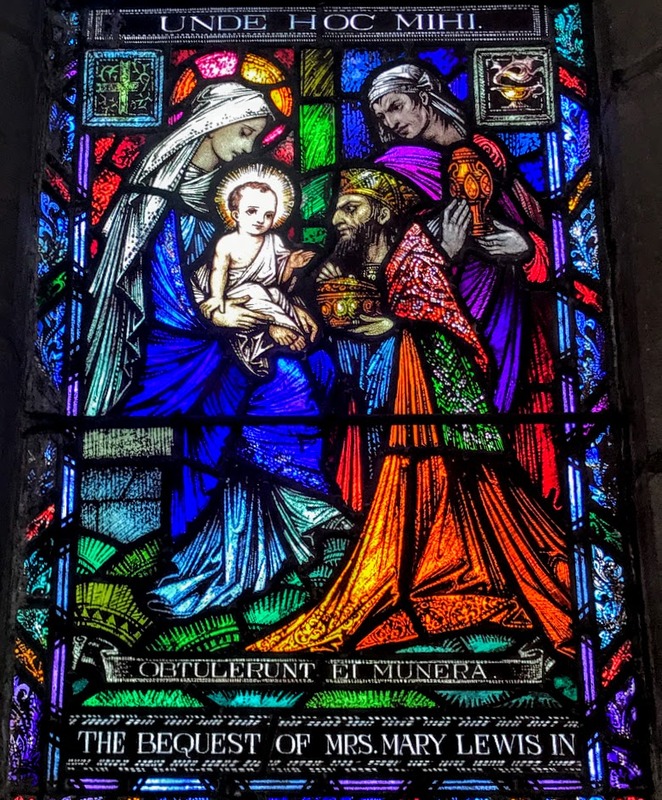 The five-light window in the Lady Chapel was inspired by the 14th century window in the south transept of the Dominican priory church. The Harry Clarke Studios also designed two scenes inserted in this window in the Lady Chapel: the Presentation in the Temple, and the Coronation of the Virgin Mary. 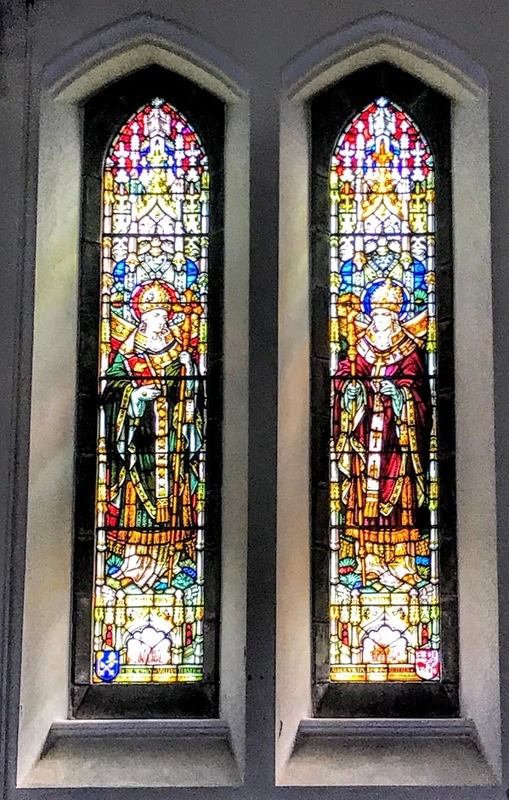 Among the many other windows in the church, one pair of lancets commemorate William Turner from Kilmallock who became Bishop of Buffalo in New York. 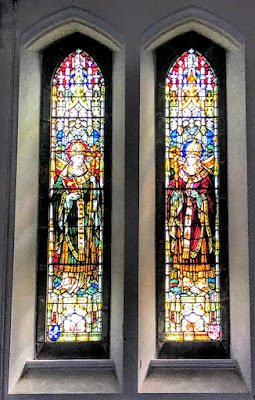 The window depicts Saint Munchin, the patron of the Diocese of Limerick, and Saint William of York, the bishop’s patron. 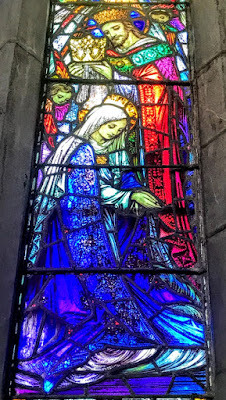 There are images too of Saint John’s Cathedral, York Minster and the Dominican priory in Kilmallock. In the corners are images of the heraldic arms of the dioceses of Limerick and Buffalo. 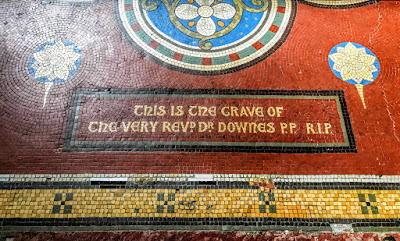 Father Thomas Downes (1841-1890), the parish priest who was the driving force behind building this church is buried in front of the High Altar. This church remains an important component of the townscape of Kilmallock, and it stands out against the skyline and the surrounding landscape because of its elegant tower and spire. The Governor’s House on O’Rahilly Street must be the most unusual building in Nenagh, Co Tipperary. 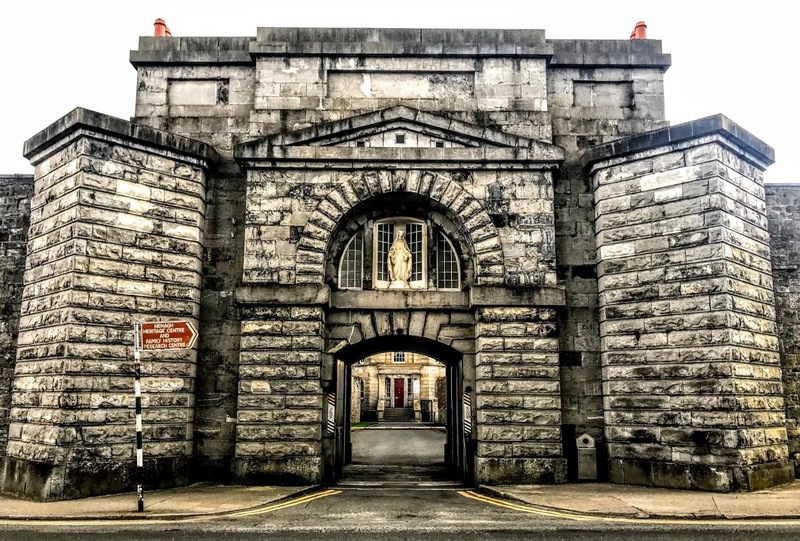 This significant part of the Nenagh’s prison complex was designed by the Dublin architect John Benjamin Keane, who also designed the town’s courthouse. With sad irony, the latter years of Keane’s career appear to have been blighted by alcoholism. 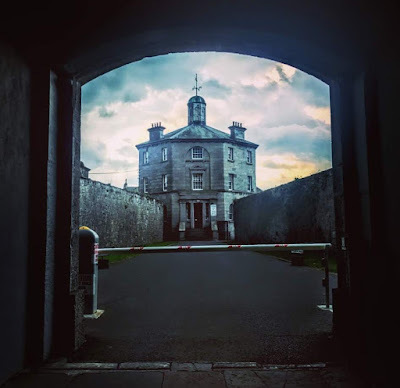 The man who designed the Governor’s House, prison and courthouse in Nenagh, fell into debt and was imprisoned in the Marshalsea gaol. He died on 7 October 1859. This is detached, octagonal-plan three-storey house, built for the prison governor in 1840-1842, with a raised basement a single-bay entrance elevation. The other seven sides have two-bay elevations. The Governor’s House stood in the centre of a prison complex, with buildings radiating out from it in a pattern that reflected the octagonal shape of the house. The windows on the ground floor are barred and round-headed, and the rest of the windows are square-headed. 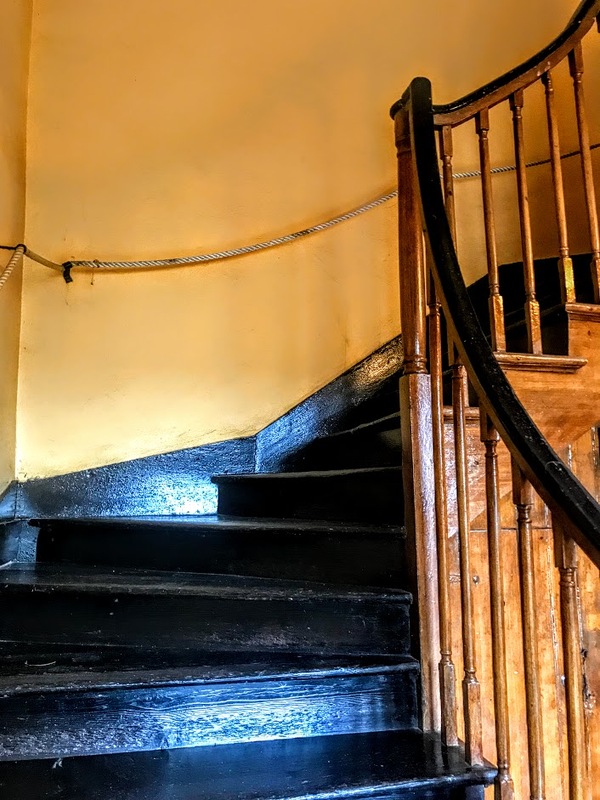 There is a timber panelled double-leaf door with fixed sidelights, flanked by cut limestone pilasters, fascia and cornice, and approached by a flight of steps. The timber battened door at the east face has a fanlight and a flight of steps. The building retains many other original features, including timber sash windows and a cast-iron weather vane. Today, the North Tipperary Genealogy Centre is located in the Governor’s House, and provides a family history research service for people tracing Irish ancestors who originated in North Tipperary. It also houses of the Nenagh Heritage Centre and Museum. The exhibits includes a model of the North Tipperary Gaol, a recreated schoolroom from 1913 Ireland, a recreation of the original kitchen from the North Tipperary Gaol, and an Irish dairy that shows the stages of butter-making and the various utensils used in Irish farming life. The Governor’s House is approached through the Gatehouse, built around 1840, almost in the style of a classical triumphal arch as part of the prison complex. It has triangular bastions instead of flanking arches and it is only when you look closely that you see it was also used as a dwelling. Local tradition says prisoners were once hanged from this arch. Condemned cells in the Gatehouse held prisoners who were sentenced to death by hanging. Between 1842 and 1858, 17 Tipperary men were executed here. 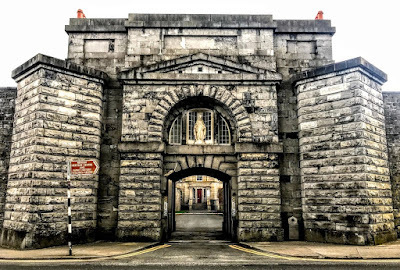 Shortly after the prison closed in 1887, it was taken over by the local Tipperary branch of the Sisters of Mercy for educational purposes. Earlier, behind the Gatehouse and the Governor’s House, the Sisters of Mercy Convent was built in 1859-1861. 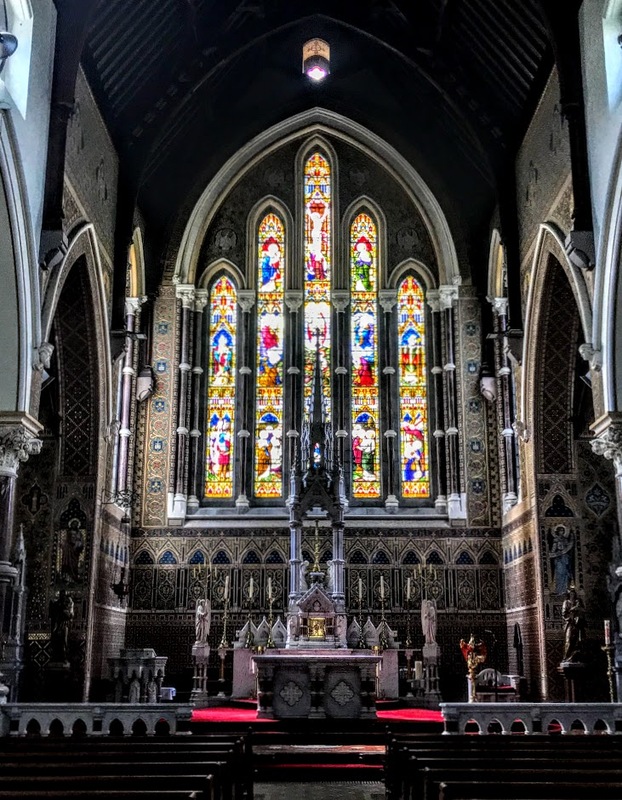 It was first designed by AWN Pugin’s son, Edward Welby Pugin (1834-1875), who designed a three-storey addition containing a chapel, community room and dining room. Later, the Limerick architect, Joseph P O’Malley (1867-1933), designed a new convent that was built in 1911-1913 at a cost of about £10,000. Joseph O’Malley was the youngest of the 12 children of Michael O’Malley, a farmer, and his wife, Kate Fleming O’Malley (1820-1901), into a family associated with the Round House in the centre of Limerick for generations. Kate Fleming O’Malley was the matriarch of the family. Her four daughters became nuns, while the rest of her family and her descendants included three Irish government ministers, Donough O’Malley, the legendary Minister for Education, Des O’Malley, founded of the Progressive Democrats, and Tim O’Malley; two Mayors of Limerick, Dessie and Michael B O’Malley; and two other Limerick Corporation members, Patrick O’Malley and his son Charlie. Kate’s granddaughter, the writer and educator Dr Pamela O’Malley (1929-2006), moved to Barcelona in 1952, was imprisoned twice in Spain by Franco’s regime. Joseph O’Malley was born in Murroe, Co Limerick, in 1867. He had BA and BE degrees and became an assistant county surveyor for Co Limerick, engineer to the Limerick Board of Guardians, engineer to Limerick No 2 District Council, and architect to Limerick District Lunatic Asylum. He married Mary Egan of Pery Square, Limerick, in 1896. She died the following year after the birth of a daughter. He later married Mary Tooher and they had nine children. Their youngest child, Donogh O’Malley, was Minister for Education in the late 1960s. 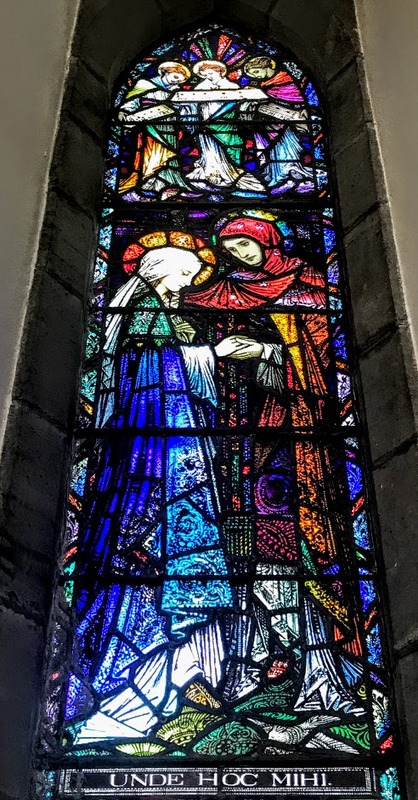 O’Malley also had a busy private practice in Limerick, working mainly with Catholic churches and convents, as well as domestic work in Limerick, Clare, Cork, Kerry and Tipperary. He was in partnership with Horace Tennyson O’Rourke in 1908-1910. He died in Corbally, Co Limerick, in 1933. O’Malley’s U-plan, two-storey convent in Nenagh has an 11-bay front elevation with an entrance breakfront and advanced terminating bays with two-storey returns to the rear. There is a cruciform-plan chapel at the north end and a recent single-bay extension at the south. The convent is built on the site of the former women’s prison and stands among the remaining prison buildings. Many of us must have watched in horror on Monday night as Notre Dame Cathedral burned against the night sky. It was horrific to see. The building itself, as a work of architecture, is one of the great works of art, one of the great landmarks of European civilisation … even for those who do not share the Christian faith. It was a story of death and burial. But on Tuesday morning, we awoke to a story of Resurrection. Thanks to the careful and precise work of the firefighters of Paris, the main structure of the building had survived the blaze. Many of the cathedral treasures had been saved as the cathedral was being evacuated, including what is said to be the Crown of Thorns from Christ’s Passion. 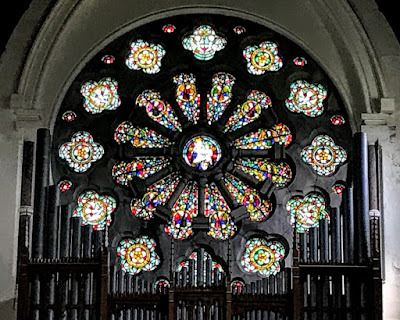 Then, in the morning, we heard not only that the fabric and the structure of the cathedral had been saved, but so too the great organ and the Rose Window – and three hives with more than 180,000 bees. And one of the first images to emerge in the dust and smoke, through the great west door of the cathedral, in the chancel at the east end, was the Cross standing unflinchingly, unscathed, above the High Altar and above the seemingly untouched Pietà, a 300-year-old white marble sculpture by the French sculptor Nicolas Coustou (1658-1733), showing the Virgin Mary cradling the limp corpse of her Christ Son. When Mary held that limp Christ-Corpse on her lap, on the womb that had borne him, she too must have thought that everything had come to an end. But Easter always offers hope. And the people of Paris must be feeling that they are being offered new hope, fresh hope, Easter hope, this Easter morning. This is not the first fire to engulf or destroy a cathedral: there was Saint Mel’s Cathedral, Longford, on Christmas Day 2009, York Minister in 1984, Coventry Cathedral in 1940, Saint Paul’s in the Great Fire of London in 1666 … and there will be many more in the future, I am sad but sure to say. I was in Lichfield Cathedral on the Day of Pentecost seven years ago [27 May 2012] when the fire alarms went off just as the Liturgy was coming to an end, and I remember how the whole cathedral went into shutdown. But the fire at Notre Dame last week caught the world’s attention, not only because of the ‘immediacy of spectacle’ television news channels offer. People everywhere have connections with Paris. It is the most-visited city in the world, and Notre Dame is one of its most-visited sites. 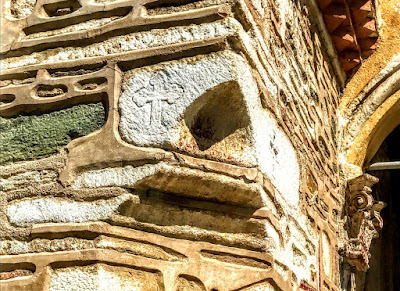 Of course, there are people to remind us that the Church is just bricks and mortar, that the Church is truly the people, or that the Church is truly the Body of Christ. And, of course, they are right. But who would claim that art is just paint on a canvas, what matters is what is in the artist’s heart? And Notre Dame, on its own, by itself, is one of the great Western works of art. 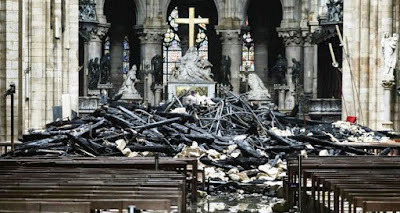 People may be cynical about the donations to save the cathedral from families that own Louis Vuitton and Gucci, when France is the sixth richest country in the world yet counts 140,000 homeless people, 30,000 of them children. Yet we know we too would scrimp and save to keep this small church open if the survival of its structure was threatened. A widow’s mite is relative to a widow’s wealth, and who would despise or dismiss it? Of course, works of art and of architectural history and of beauty rely on the ingenuity of people, and it is people who must be protected above all else. Yet, once the restoration work commences, it will revive the skills of artists and artisans, carpenters, stuccodores and stone masons, wood turners, sculptors and painters. Countless small businesses will be revived, young people now unemployed will be offered apprenticeships as electricians and painter, joiners and plumbers, all because of this fire, and because some billionaires are not leaving their money resting idly in bank accounts or hedge funds, passively accumulating more interest and more wealth. And this cathedral will, hopefully, continue to call people to worship God and to communion with each other for another 850 years. Over the years, on several occasions, I too have visited Notre Dame, the spiritual heart of Paris and of France. On one visit to Paris some years ago, we were visiting Notre Dame. One elderly family member questioned what she saw as the ostentation of the cathedral, and was disturbed, at the same time, by the large number of tourists trudging through, taking in their 30-minute experience of Notre Dame, without pausing to pray or reflect, even as the Mass was being celebrated in a side chapel. At the time, I was working for an Anglican mission agency, and I was asked what I thought was the mission of Notre Dame. I looked around, and noticed the large number of confession boxes, each offering the sacrament of reconciliation to visitors in a different language – French, English, German, Spanish, Italian, Korean … there must have been 10 different languages in all. I made a quick calculation. It was a leap year. If each priest in each confession box heard only three confessions a day (say morning, noon and afternoon), then over the full 366 days that year Notre Dame would have been instrumental in reconciling at least 10,980 people with God, with the Church and with their own souls. And that is probably a low estimate, a very minimalist calculation. If the mission agency I was working could state in its annual report that it reconciled 10,980 people, if not more, with God, with the Church and with their own souls each year, it would have no problem in fundraising in parishes and dioceses throughout the Church. This has been the mission of Notre Dame for over 850 years … over 9 million people, at the lowest possible calculation. 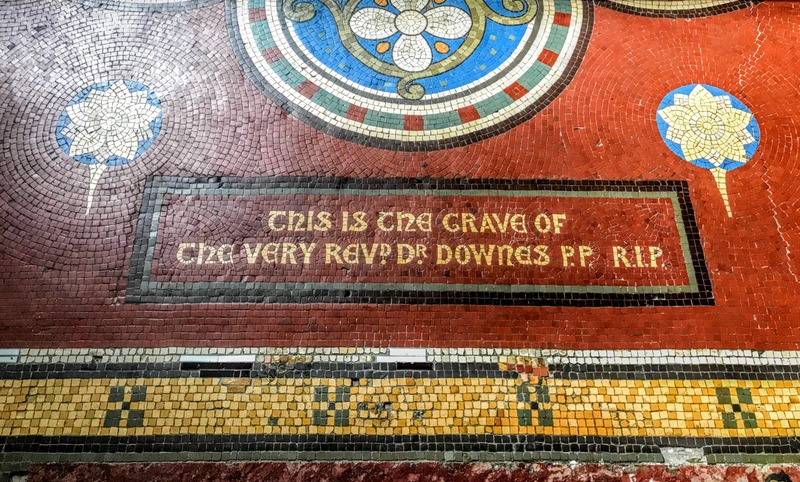 This is the mission of every cathedral. 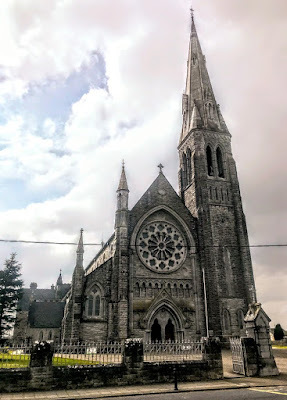 Notre Dame is the same age as Saint Mary’s Cathedral, Limerick, and both share the same dedication and patronage, as does Saint Mary’s Church, Askeaton. Cathedrals are the mission of the church in cities, where the stranger meets the Risen Christ, where the Risen Christ welcomes the unwelcome, where beauty shines through the grime and dirt of everyday life. Their liturgy and their visible beauty hide a more beautiful, inestimable truth they hold as a treasure for the life of the Church and in the life of society. For the sake of 9 million people over the next 850 years, I hope Notre Dame recovers quickly from last week’s disaster. Easter always offers the hope of new life. 11 But Mary stood weeping outside the tomb. As she wept, she bent over to look into the tomb; 12 and she saw two angels in white, sitting where the body of Jesus had been lying, one at the head and the other at the feet. 13 They said to her, “Woman, why are you weeping?” She said to them, “They have taken away my Lord, and I do not know where they have laid him.” 14 When she had said this, she turned around and saw Jesus standing there, but she did not know that it was Jesus. 15 Jesus said to her, “Woman, why are you weeping? Whom are you looking for?” Supposing him to be the gardener, she said to him, “Sir, if you have carried him away, tell me where you have laid him, and I will take him away.” 16 Jesus said to her, “Mary!” She turned and said to him in Hebrew, “Rabbouni!” (which means Teacher). 17 Jesus said to her, “Do not hold on to me, because I have not yet ascended to the Father. But go to my brothers and say to them, ‘I am ascending to my Father and your Father, to my God and your God’.” 18 Mary Magdalene went and announced to the disciples, “I have seen the Lord”; and she told them that he had said these things to her.